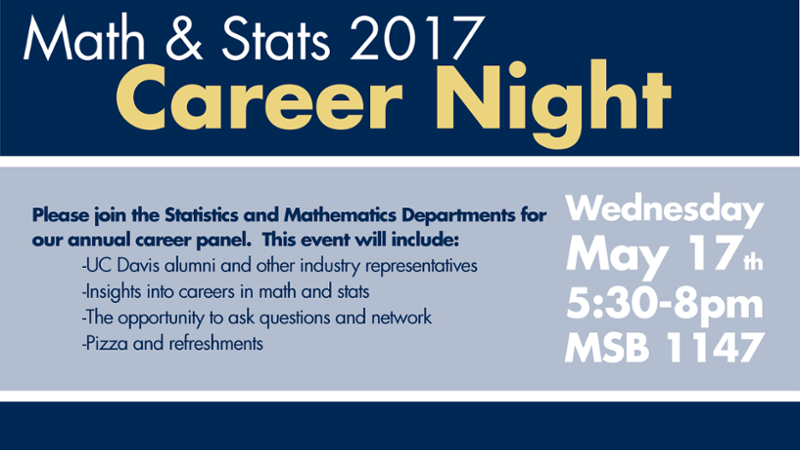 Please join the Departments of Mathematics and of Statistics for an informal panel discussion on career development. Topics will include how to network and market yourself to industry recruiters, what skills and abilities are important in your area of interest, and what search techniques you should utilize when applying for potential jobs. You will have the opportunity to ask questions of the panelists. Pizza and refreshments will be provided. Michael Jun graduated from UC Berkeley with a B.S in Electrical Engineering and Computer Science (EECS) and Engineering Math and Stats (EMS). After graduation, he took a position with Google in Mountain View as a Software Engineer, working on Search Infrastructure. Kate graduated from UC Davis with a B.S. in Mathematics. After graduation she took a position in the Analyst Development Program (ADP) with Liberty Mutual in Seattle, WA. She currently is rotating with the Product Design and Modelling team, which analyses and builds statistical models for different insurance coverages and products. Shelly Chopra is currently a 4th year undergraduate student double majoring in Applied Statistics and Economics. With a strong interest in finance and analyzing investment data, she sought an internship that would allow her to apply her statistical knowledge in the workplace at a financial services company. She is now an intern on the analytics team at State Street Corporation, a mutual fund located in Natomas, California which has helped her develop strong technical and soft skills that would be invaluable for many data-driven job positions. After graduating, she is interested in obtaining a master's degree in financial engineering or statistics to help her eventually become a quantitative analyst for an investment bank or an insurance company. Mary-Betty Stevenson is an academic coordinator for the Math and Science Teaching Program (MAST) at UC Davis. You can find out more about MAST here. Apratim Ganguly– Senior Statistician @ Natera Inc.
Apratim Ganguly graduated from UC Davis in 2014 with a PhD in Statistics. Thier PhD supervisor was Prof. Wolfgang Polonik. Before UC Davis, they had a Bachelor's and Master's degree in Statistics from Indian Statistical Institute. They worked as a Postdoctoral Associate with Prof. Eric Kolaczyk in Boston University for a year and currently they work as a Senior Statistician in Natera Inc., a biotech firm in SF Bay area. They develop statistical models and algorithms with applications in Prenatal healthcare and Oncology using large scale sequencing datasets. Sana graduated in June 2016 with a B.A in Economics, and a B.S in Applied Statistics. Directly after graduating, she started working with Willis Towers Watson, which is a global insurance broking and risk management consulting company. The company is divided into four main sectors; Corporate Risk and Broking, Exchange Solutions, Human Capital and Benefits, and Investment Risk and Reinsurance. All four sectors advise and design coverage structures to mitigate risk for their clients. Currently, Sana sides with the Investment, Risk and Reinsurance sector. Specifically, I work as a Catastrophe Modeler with our Catastrophe Analytics team. Her job consists of scrubbing data in SQL, quantifying catastrophe risk for insurers with several in-house softwares, as well as working with other parts of the CA team to code earthquake and wildfire predictive models in R.
Tom Denton obtained a PhD in Math from UCDavis in 2011, working in algebraic combinatorics. He then went on to a postdoc at York University, in Toronto, and a Fulbright working in math education in East Africa. Since then, he has been working at YouTube, where his focus is on making cat videos more accessible to people in countries with poor internet access. In his spare time, Tom plays with synthesizers, neural networks and graph theory.